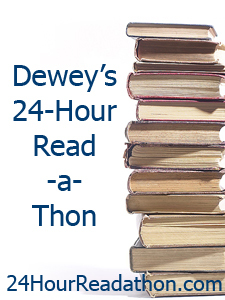 The Towering Pile: Dewey's 24 Hour Read-a-Thon begins! Yippeeeeee! It's time for 24 hours of non-stop reading! This one snuck up on me a bit, so I nearly didn't have a book pile ready! I totally threw it together last night. So, I'm leaving it open to mid-read-a-thon switch-ups if necessary. That gives me a total of 998 pages. In my more successful read-a-thons I've exceeded that number, so there's a chance I'll finish this pile and have to find something else. I do have a few chapters left of The Map of Time by Félix J. Palma, so I could just finish that if I have some extra time. We'll see how I do!